Like all cities and townships in Germany, the spoken language is Hamburg is not quite as simple as ’German’. Residents of the city have their own variation on the national dialect known as Hamburgisch or Plattdeutsch. A variation on Low German, this parlance is actually the closest German language comes to replicating English. The weather in Hamburg is similar to that in most major German cities – hot but wet summers, and fierce, cold winters. Expect temperatures to drop below freezing in January, and to shoot sky-high in July and August – though these sun-kissed months will be countered by heavy rainfalls. The Hamburg authorities are pretty strict on allowing internationals to enter the city on a freelance or self-employed basis (you’ll need to be dubbed a ‘skilled tradesperson’ and registered on the Handwerksrolle to receive permission to work in the city), so it is advisable to arrange all the necessary steps before arriving – preferably in the form of a concrete full-time job offer from local employer. Visiting Washington’s German embassy, or any of the consulates in the nation’s other cities, is the fastest and most reliable way if achieving this. As is standard for any European country, you’ll be able to enter Hamburg for up to three months without a Visa, so that’s ideal for apartment-hunting and job interviews. When the time comes to start work though, you’ll need one of two permits. An Aufenthaltserlaubnis is the most likely, which acts as a provisional residence permit, lasting one, two or three years and renewable at the consulate when necessary. Once you have spent a prolonged period of time in Hamburg you can then apply for a Niederlassungserlaubnis, which is allows permanent relocation. You will need to have spent five years in Germany to be eligible, though (three if you are married to a German national), and take an exam to prove that you have acclimatized to German living and will contribute to the good of the country. You will not be able to visit the formal American Embassy of Germany without making a three-hour drive to Berlin, but Hamburg does have a US Consulate that will service any needs you may have surrounding work permits and passports. The consulate is located close to the city coastline on Alsterufer. If you’re looking to relocate your pet along with your family, there are a few steps that you’ll have to take first. Ensure that your cat or dog has been microchipped (this is a legal requirement in Germany), and get them up to date on all vaccines – most important among these is rabies. You’ll also need to ensure that your dog is not on Germany’s banned list, and upon arrival, register your pet within a fortnight of setting foot in Hamburg. This also means that you’ll have to pay an annual dog tax. The good news is that Hamburg is extremely pet-friendly. There aren’t quite as many substantial green spaces as you may find in other cities, but your furry friend will be welcome to join you in many eateries and bars, as well as the beach. Just make sure you clean up after Fido once he has done his business – letting a dog foul a public space and not picking up after them is a huge no-no in Germany. Most shops will actually hand over a poop bag for free upon request. Hamburg boasts Germany’s biggest seaport, so it’s highly recommended that you ship over your worldly goods by boat – you’ll save a small fortune on air couriers, and have east access to collecting everything once it arrives. This will obviously take significantly longer than an air courier, but the cost effectiveness will speak for itself. Very little, to be honest – Hamburg has you covered, as long as you are prepared for the elements – don’t forget to pack your umbrella and waterproofs, and a thick jumper or coat if you’re travelling in winter. You can leave your treasured designer belongings behind in the States and pick up replacements in the city though, as Hamburg has formerly been dubbed the fashion capital of Germany. That status may have been overtaken by Berlin, but there is still plenty of luxury shopping available in the city. Work is plentiful in Hamburg, and if you are artistically inclined so much the better – this city is widely regarded as the heart of Germany’s media culture, employing almost 100,00 people – both native and international. The size of the port in the city also means that this is a major employer, and if you have experience in the financial sector you’ll be able to find work without too much struggle – Hamburg has a reputation as an important banking city, and while Frankfurt tends to host more business sectors, the stock exchange in Hamburg is the most well-established in the country. Construction work is also abundant, though that’s one sector that a non-German speaker may struggle to flourish within. Hamburg has one major international school, catering to children aged 3-18 – the first international school in the country, no less. The curriculum is not necessarily US-centric, focusing on the International Baccalaureate (IB), but the reputation of the education center speaks for itself. Hamburg can boast an eye-watering seventeen Universities, although only six of these are public. The University of Hamburg is hugely reputable, but given the artistic and media-centric nature of the city, don’t neglect the University of Music and Theater (though you’ll have to be fluent in German to negotiate the website). Those of a more scientific bent may also prefer to investigate the Hamburg University of Applied Sciences. Asklepios Clinic Barmbek is located in Hamburg, and enjoys a reputation as the finest hospital in the world for medical tourists, suggesting that perhaps this is a great location for US nationals. The hospital is well equipped to meet the needs of international patients, and it’s just one of over fifty such buildings in the city. How will you be expected to pay for any treatment, though? The healthcare system in Germany operates on an insurance scheme, the expense of which is shared between individuals and their employer – how much of this you pay depends on the number of 0s on your paycheck. Private healthcare is an option, however, so if you can afford it – or your employer is prepared to offer it as a perk – grasp this opportunity with both hands. German hospitals are great and all, but sometimes patients are checked in unnecessarily and allowed to stay longer than is strictly required, which can lead to long waiting lists for anybody not equipped with their own policy. The cost of living in Hamburg is pretty reasonable for a major European city – and it’s roughly half of a major American location such as New York. You’ll be able to rent a substantial apartment in the heart of the city center for around €1,300 (equivalent to about $1,500), and it’s a very reasonably priced area for entertaining yourself; if you are laying out an excess of €50 for great meal for two in a high-caliber restaurant, you are paying through the nose. Other luxuries such as gym memberships are also inexpensive (Germany as a nation are very health conscious), and if you want to unwind with a beer after a workout you’ll rarely pay more than €4. Citizens of Hamburg enjoy a higher-than-average purchase power in the country of Germany – which, considering the nation enjoys all the perks of an extremely strong currency in the form of the euro, is not something to be taken lightly. 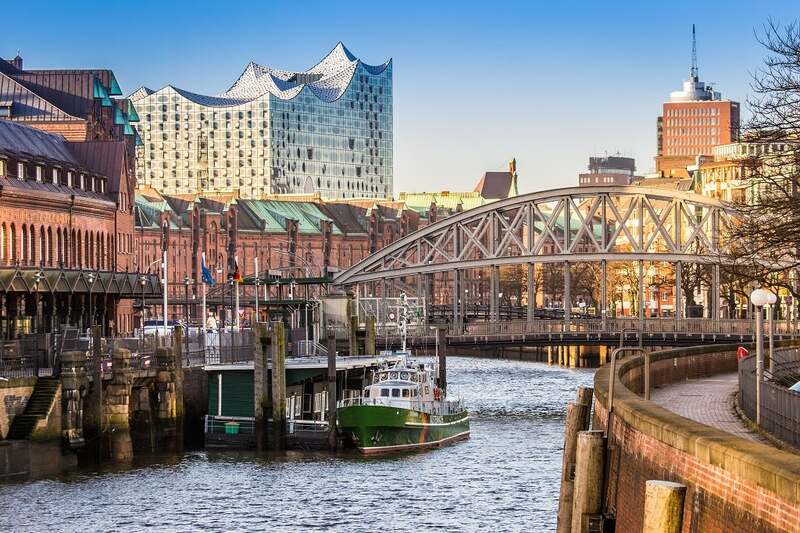 The economic upturn of Hamburg has slowed down slightly as other cities in Germany catch up, but there are still plenty of financial perks to be found by basing yourself here. There are several major Autobahnens (aka freeways) out of Hamburg that connect the city with the rest of Germany, making it a great location if you’re planning on checking out other Teutonic territories after you’ve moved. The only problem is that your US driver’s license is not necessarily a simple transfer. A German permit is called a Führerschein, and getting your hands on one may involve taking a written and practical driving test in Hamburg – accruing all the expenses involved in such a process. Check whether your current address allows you to make a comparatively simple transition, but if not, book yourself into a Hamburg driving school as soon you arrive; your American license is only legal for six months, and it could take six to eight weeks for your Führerschein to arrive once you have completed the relevant testing. Like all German cities, the public transport options in Hamburg are the very picture of efficiency. Overground and underground trains run with constant regularity, from 4.30am – 1am each day (24 hours over the weekend), as well as a handful of buses – all of which are extremely reasonably priced. What’s more, Hamburg also offers a number of ferry services from the city’s port. Hamburg enjoys the services of a large international airport (the IATA of which is HAM), just twenty minutes away from the city center. You won’t be able to fly directly in from the States, though – Hamburg Airport only serves European destinations, with the most popular airlines in the airport including Eurowings and Germanwings – as well as a number of low-cost airlines, which makes Hamburg a great city for exploring nearby destinations. The largest seaport in Germany is located in Hamburg, making this city a thriving center of activity for all ship-related activity. The port is a major employer, handles a great deal of commerce, will save you a small fortune on shipping fees when you are looking to bring your possessions over from the States, and offers access the cruises to a variety of locations. There are seven primary boroughs in Hamburg, each of which offer something different – whatever if it is that you’re looking for, you’ll be able to find a locale that suits your needs. If you have plenty of cash and want to be in the very heart of the city, don’t look any further than Mitte – it’s a costly place to find an apartment, but you’ll be surrounded by museums, restaurants and bars, as well as all the shopping that you could possibly get your hands on and most of the business centers. If you’re keen to be close to the action but would prefer somewhere a little quieter, check out Altona – here you’ll find all kinds of independent businesses. Eimsbüttel is a little more relaxing by day, filled with public parks and other green spaces, but it’s not far from the University so you may find some of the local populace to be boisterous when the sun goes down. Head further afield to Hamburg Nord for a more rural environment that’s still within a sensible distance of the city center. For the perfect family environment, you can’t go far wrong with Wandsbek – not far from the beating heart of the city, but largely designed as a residential area with plenty of apartments and houses. Try to avoid Hauptbahnhof, as the police tend not to venture here and the crime rate is a little higher. St. George is an interesting part of the city, and if you’re interested in getting on the ground level of an up-and-coming area it could be worth a look, but be warned that this gentrification is very much a work in progress and may result in some resistance from the locals. There is plenty of culture to enjoy in Hamburg thanks to the reputation of the city as a media hub – and a great deal of theater is performed in the English language. Unsurprisingly, The English Theater of Hamburg is one of the most celebrated providers of such entertainment. You’ll also find over fifty museums in the city (primarily historical), while the Hamburg State Opera and Philharmoniker Hamburg orchestra enjoy a great reputation. Hamburg is something of a rock ‘n roll hotbed too, with many of Germany’s greatest heavy metal bands of the 1980s emerging from the area. There are a handful of annual events that take place in Hamburg each year. A traveling carnival makes its way to the Holy Spirit Field for a month at a time three times a year, while every August the city’s fish market trades places with the Stuttgart Wine Festival for two weeks. Christmas markets will line the streets every holiday season. There are also two parades exclusive to Hamburg that unfold annually; the Hamburg Harbor Birthday, which celebrates all things connected to the city’s seafaring traditions every May, and the Christopher Street Day Parade each June, an essential date in the diary of any LGBTQ Hamburg resident. If sports are your passion, there are few better cities than Hamburg to base yourself in. Of course, the city is soccer-crazy. Two clubs ply their trade in Hamburg, with Hamburger e.V. the premier team. It has been a while since Hamburger enjoyed a sustained period of success, but the Volksparkstadion is rarely less than full thanks to a loyal and dedicated fan base – and anybody not there may well be in the Millerntor-Stadion, watching local rivals St. Pauli. St. Pauli are present plying their trade in a lower division, but are taken to the hearts of many Germans outside of Hamburger fans thanks to their punk rock ethics; the football club are closely identified with left-wing politics. It’s worth checking out a game, if only for the sausage train that runs on an electric track throughout that stadium. Don’t worry if you have never managed to fall in love with soccer, though; Hamburg also hosts a number of traditional American sports. The HSV Stealers play in the country’s top baseball league, the Hamburg Freezers frequently top the table in ice hockey, the Hamburg Blue Devils is a popular and successful football team, and BCJ Hamburg and Hamburg Towers have basketball covered. Cricket, lacrosse and field hockey are also popular in Hamburg – and best of all, each of these sports have women’s teams that are treated just are respectfully as their male counterparts. Hamburg is largely a safe city, with the biggest concerns surrounding extreme left-wing political ideals. Obviously this will make the city particularly welcoming if you belong to a minority, but if you harbor more conservative viewpoints you may be best served keeping them to yourself unless you are comfortable with the company you keep! Even the Reeperbahn, Hamburg’s Red Light District, is considered to be safe – hence why it is a major tourist attraction. The first place to investigate for a night of partying in Hamburg is Reeperbahn, the Red Light District of the city. Don’t be put off – sure, the area is a little seedier than the cleaner-cut city center, but there are some excellent bars and clubs to be found. You’ll even be able to take in a popular musical should you wish to embrace such an evening, and Beatlemaniacs will delight in touring the many different locales that the pop legends played in during the 1960s. Reeperbahn is largely safe and is considered a haven of hedonism, so the world thing to befall a Hamburg resident here is probably the sheer number of tourists that swarm the area. Don’t forget that Hamburg is based on the German coast, which means that open-air beach parties are the order of the day during the summer, and if you’re looking for something a little more upmarket you can sip on cocktails in Old Town. You’ll also find all kinds of different brewing houses and microbreweries all over Hamburg, serving traditional German food and snacks as well as lip-smacking pilsners to tantalize all taste buds. Many of the restaurants in Hamburg serve up German food, but you’ll also manage to find all kinds of international cuisines throughout the city. Overall, you’ll be able to enjoy a great night out in Hamburg without breaking the bank. What’s not to love? Hamburg has been the subject of a handful of classic works of fiction, and there is plenty of advance reading from the factual shelves of any bookstore that will prepare you for your relocation. Journey to the Center of the Earth, by Jules Verne – the most celebrated science fiction novelist of them all may have been French, but this acclaimed tale is set in Hamburg. A Most Wanted Man, by John Le Carré – the king of spy fiction based this book on his own experiences of espionage in Hamburg, and this novel unfolds within the city. Blood Eagle, by Craig Russell – the first in a series of crime novels set in Hamburg that revolve around the character of detective Jan Fabel, followed by Brother Grimm, Eternal, The Carnival Master, The Valkyrie Song, A Fear of Dark Water and The Ghosts of Altona. Love Among the Ruins: A Memoir of Life and Love in Hamburg, 1945, by Harry Leslie Smith – a memoir from an RAF soldier that lived in the city post-WW2. The Beatles in Hamburg: The Stories, the Scene and How it All Began, by Spencer Leigh – Hamburg plays a pivotal role in the history of The Beatles, and this book is a must-read for any aficionado of the British pop legends. Firestorm Hamburg: The Facts Surrounding the Destruction of a German City 1943, by Martin Middlebrook – Hamburg has a history steeped in WW2, and this book will fill you in on how much of the city has been rebuilt over the last century.